How do I cook Steak Diane? Well, apparently Diana was the Roman Goddess of the hunt and wild animals. She was also the head honcho in protection of women and was associated with chastity, marriage, and fertility. If you see pictures of Diana she is often accompanied by a deer. Legend has it that Diana was bathing, naked, and was confronted by a hunter. Being a Goddess she had the power to turn the hunter into a stag. Hence in it’s early incarnations any sauce made ‘a la Diane’ were associated with venison. Auguste Escoffier first mentioned Sauce Diane in 1907 when his recipe added hard cooked egg white to the previous formula of cream, truffles and heaps of black pepper. 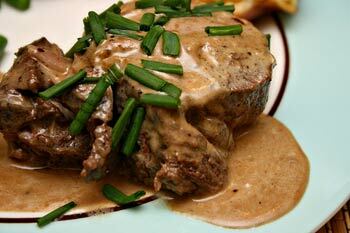 So, Steak Diane has a long and varied history – there are many variations of this classic recipe and no two recipes are ever the same. The one here though is the classic retro 1970’s version that you will still find on provincial recipes around the back roads of New Zealand. I once ate Steak Diane in Hawera, in a hotel near the racecourse, served by a waitress called, appropriately, Di. It only seemed right that I should eat in her honour – and so I did. Melt the butter in a saucepan and fry the shallots until dry and slightly shrivelled but not brown. Stir with a metal spoon occasionally. Add the flour and continue cooking until the flour and shallots are a rich brown. Pour on the stock and add all the remaining sauce ingredients. Stir well, and bring to the boil and simmer for 30 minutes until reduced by half. Strain but do not sieve, then cover the sauce and set aside until required. To complete the dish just before serving, have all the ingredients ready and the guests assembled. Use one large or two medium frying pans and heat until very hot. Drop in the butter and then the steaks to brown on each side. Pour over the brandy or sherry and cook for 2-3 minutes more; the vapours my be ignited if you wish with a match or gas flame. Put all the steaks in one pan if two were used. Pour over the brown sauce and Worcestershire sauce, bring to the boil, sprinkle with parsley and serve. If you have variations or recommendations on this classic recipe please email [email protected]. We’d love to hear from you. Beef steak has always been my all time favorite dish and i am always looking for some new recipes that has steak as the main ingredient.~-.